INDIANAPOLIS — Hino Trucks is expanding into the heavy-duty sector in the United States with the introduction March 7 of its new Classes 7 and 8 XL model series truck and tractor. 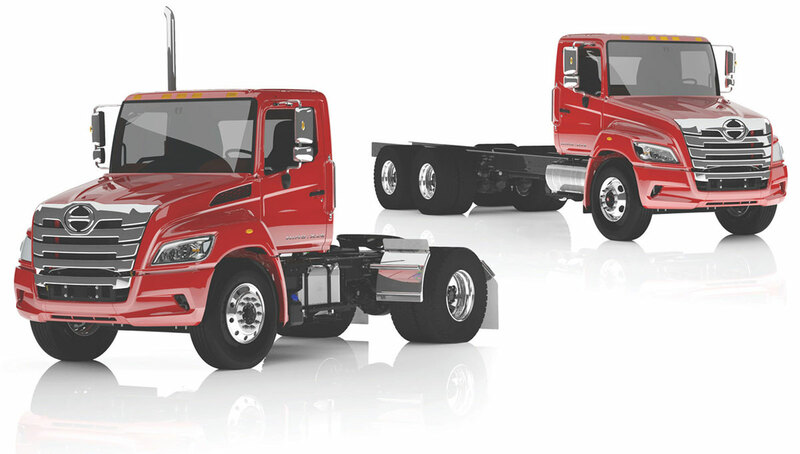 While Hino has been supplying heavy-duty trucks outside the United States for a long time, until now its U.S. lineup focused on the light-medium market. "This will launch us into the vocational sector," Glenn Ellis, vice president of customer experience, said from the NTEA Work Truck Show here, where the models were introduced. Both trucks will be powered by Hino’s A09 8.9-liter 6-cylinder turbo diesel with ratings up to 360 horsepower and 1,150 pound-feet of torque. The trucks will be available in straight truck and tractor configurations with gross vehicle weight ratings from 33,000 to 60,000 pounds. Company executives acknowledged during a press conference here that success would be challenging. “No [original equipment manufacturer] entering the Class 8 market has been successful over the past 50 years,” said Dominik Beckman, director of marketing and dealer operations. Nevertheless, Beckman said, the new trucks provide a viable, low-cost option in the market. The XL models will offer a range of features such as electronic stability control (standard on the tractor), collision mitigation systems, payload management suspension options and Hino Insight, the company-branded telematics system, which will be free for the customer’s first year. No [OEM] entering the Class 8 market has been successful over the past 50 years. The trucks will be built at a new factory in Mineral Wells, W.Va., currently being outfitted. The 4x2 versions will be available in the first quarter of 2019 and 6x4 versions will follow in the second quarter, Ellis said. Additionally, the current U.S. conventional models will be refreshed in 2020 and COE models will be updated in 2021, company executives said.